Winston Churchill, November 10, 1942. Back in 1998 in an article for Dell Horoscope entitled “The Hammer of Destiny" we surmised that the coming (then) transit of Pluto to the U.S.A. Ascendant (12 Sagittarius, the Sibly chart) in 2000 would indicate a suppression and then a transformation of the country’s world power and the transfer of control and influence to a cooperative mix of nations in the world community. And that was only if war was avoided and if the country adapted without resisting the hammer-like transit of Pluto. The history of both nations and individuals shows that when you roll with this transit, you rise and grow, but when you don’t, it’s like beating your head against a wall. Unfortunately war was not avoided, and the country’s response was to fly in the face of implacable Pluto and fire its guns in all directions, mostly in solo disregard of the rest of the world. It was as if its superpower status was by divine right, and thus unassailable. Unfortunately, the mill grinds slowly but exceeding small, and one of the prime wisdoms of power has gone largely unnoted: you don’t fire all your guns all the time or you run out of ammo. That’s not only true here below, it’s true above, where Mars inevitably goes retrograde and pulls back once every two years. In the case of the U.S., its natal Mars went retrograde last July (July 16th, 2006, for the 12 Sag. Chart, at 18 Libra), and will remain so for another 80 years. It could be said the unflagging energy of this tremendous, expansive chart has reached its outward limits, and a withdrawal is about to begin. Whether that will be an orderly and graceful rearrangement is yet to be determined, because the progressed Sun only just entered Pisces the day of the last presidential election, hard upon progressed Mercury going retrograde. It would seem from all of this that there really isn’t a plan, and a confused, Neptune fog has settled upon the whole nation in the midst of its outer and inner challenges. That will change, as it always has. More about that, and the march of the U.S. progressed Sun here. Is there help around the corner? Probably not, at least until 2008-2009. Until then, those in power, whoever they are, simply can’t help being, as we have pointed out, on the wrong side. But after then, what? A nick-of-time scramble to get back on the right track, fired by a new set of elections? With America’s progressed Moon full at the new presidential inauguration 2009, that’s greatly to be hoped for — but, for those who think the world will end in 2012, it should only be so swift. In this promised world without end, amen, there is more yet to be borne. That year sees the American progressed Moon conjoin its natal Saturn, then its progressed Saturn the year following, ensued by a first-time-ever affliction that is a phenomenon in itself: the race of progressed Moon with transiting Saturn. The cycle of the progressed Moon is approximately 27 ½ years while the cycle of transiting Saturn is approximately 29 ½ years, so on average the progressed Moon gains about 0.8 degrees on transiting Saturn every year. That means when they make an aspect, they stay there, in and out, for about a decade. The mean conjunction of the U.S. progressed Moon and Saturn occurs in 2020, but the Moon will see the ravages of retrograde Saturn geocentrically several years before then and its touches will continue for several years after that time. It will be a long, slow slog when the people (Moon) will have a burden to bear (Saturn) that will be difficult to shrug, shortened only by the fact that the progressed Moon is fortunately swift in motion and pushes through in half the usual time (an echo of Mark 13:20). What will that burden be? 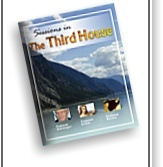 The huge debt amassing now and due then (2nd house)? The historical reputation that must be rebuilt (8th house)? It’s hard to say, but it will be severely illuminated through some other dark lenses as well. After Uranus smacks progressed Venus and Neptune derails the progressed Sun in 2018-19, 2020 sees the progressed Moon and transiting Saturn conjoin natal Pluto (27 Capricorn) within months of each other, and a triple Pluto return in 2022. Not an easy twilight for baby boomers whose early lives escaped the last world conflagration but whose later years may see wholesale decline due to self-inflicted injuries of political pride and selfishness. Meanwhile, their children, who will be running the show by that time, will share the price of their wholesale neglect and hopefully set things right again. Certainly the 20-year Jupiter-Saturn conjunction, which tends to mark world political shifts, will mean some serious corners turned during and just after 2020, as it did in 2000 (opposite Pluto), 1980, 1961, 1940, and so on. This is the first Jupiter-Saturn conjunction with Pluto since 1444, when there was another pair, one opposite, one conjunct, in a row: 1444 & 1464 at the rise of the Ottoman Empire and the fall of Constantople. Only two more such sets have occurred since the time of Christ, 709 & 729 at the high tide of Muslim expansion checked by the Battle of Tours, and 1265 & 1285 at the height of the Christian reaction and the last of the Crusades. Pluto seems to have a fondness for the Middle East and its issues, so don't expect this time around to be any different. Last year’s progressed Mars retrograde is perhaps most symbolic of the end of the early stages of this latest shift, as the dogs of war are released in the Mideast while America loses the focus and the stiffener needed to see the situation through all by itself. 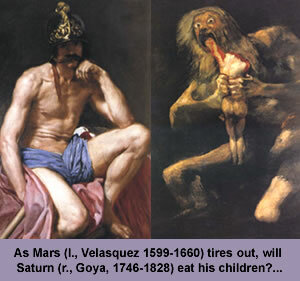 And when Mars is no longer up to it, Saturn goes back to eating his children until Pluto finally puts a stop to it all. So what do you do? It’s a rough backslide for America, though some other portions of the world may benefit from the rearrangements as the momentarily solo superpower learns to share credit, blame, and responsibility. Perhaps it’s destiny, perhaps it’s partially about a nation finally growing up. Nevertheless, if the Pluto transit of 2000 was the beginning of the end, unregistered by most, then perhaps this is the end of the beginning.